There’s no doubt that Ekaterina Shulman’s ability to formulate concisely and calmly the results of sociological studies and to spice them with her own analysis is like a gold nugget in the general muck produced by many Kremlin-watchers. She stops short, however, of delivering more specific recipes for action to the watched powers. Do they exist? Or is a wholesale reform of the relationship between the state and the public unavoidable? Shulman herself talks about a clear need in the society, especially among the 20-to-40 generation, for mutual respect between the state and the society rather than reward-and-punishment attitude to the public the state has been practicing over the past 15-odd years. This kind of change is the most difficult to engineer and is unlikely, IMHO, to take place from within the current generation of political, administrative and business elites. Normal and abnormal don’t strike me as political science terms for evaluating a political system or society. This is a medical diagnosis. I’m not so sure of the argument’s validity, when information technology is rapidly pulling up all the roots of the above in the West itself: In an era of Trumpism and Brexit, where the ability to get an idea repeated hundreds of times on Facebook is worth a division of troops, and of cross-border crime that the Western states have don’t legislation on the books to even define yet, let alone prosecute, the era Schulmann is referring too of normal nation state behaviour belongs to a few decades ago at best. And whilst the West muddles around, other societies are already coming out with hard answers to that radically different world; China’s social credit system is one example of how a totalitarian state can be both aware of, and utilizing the massive soft power of technology in it’s own interests (espionage, IP theft etc), but also terrified of and denying it too it’s own people… with, from the point of view of the needs of a functioning nation state in said new world, what may (or may not) be actually somewhat valid reasons. At the very least, anyone even in the West already knows the social problems of allowing people to be anonymous online arseholes, and those of us who’ve had worse experiences, the almost impossibility of getting the state or anyone else to be able to protect you the average citizen from them. So maybe Russia is actually better prepared for The World To Come than the West too, and that’s a good thing? I don’t know, but I certainly don’t think it’s as obvious that Russia is “abnormal” for these now abnormal times. Undesirable is perhaps a better word, but as the typical meme respond would have it, “That’s just like, your opinion man” … and therein lies the rub today. It is. I wasn’t being naughty. However, probably someone like Stephen Kotkin or others would quickly wire brush you and lay out the case why the current regime in Russia is decidedly normal, rather than abnormal. The regime is surely a product of the society, and would not have lasted this long, were it a transplant from Mars. As someone else pointed out, what is normal here? The West may be moving away from the very model that Russia is moving towards. 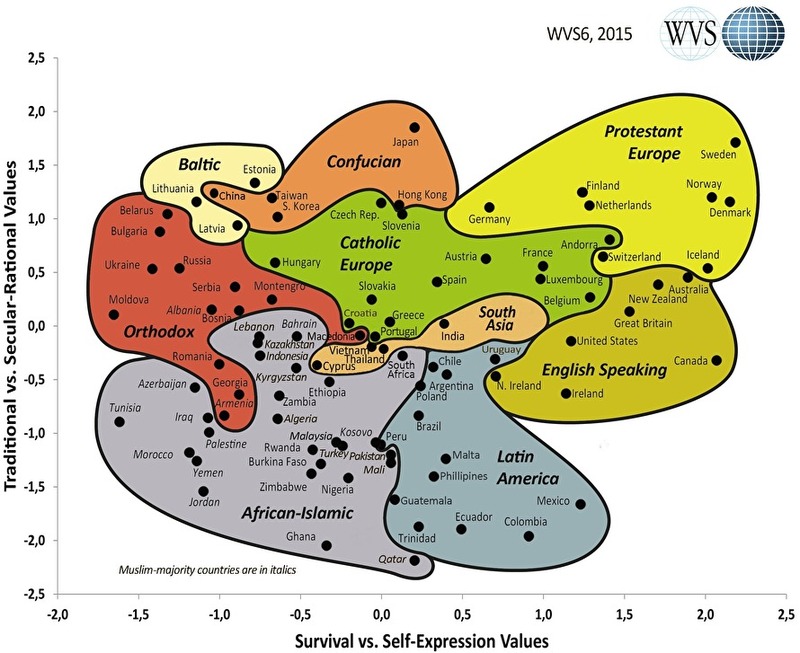 Now, the whole survival versus self expression values thing is interesting, however, what does that mean here? How would that interact with say, global warming, which is likely to be quite destructive soon, and automation, which may very well trash the economic system we currently have right when Russia would be wanting to further economically liberalize, depending on what happens. Now, I disagree on the social credit system, as from what I understand, that’s mostly a myth out of bad reporting on how some stuff in China is working internally.